I continue to really like this series. Sure, the writing isn’t sparkling deathless prose, but it’s functional and brings across the voice of the narrator — very no-nonsense, down to earth, tough-talking woman. What continues to intrigue and please me is the characterisation of Kate: stubborn, pig-headed, yes, but also willing to admit when she’s wrong, picking her battles, not afraid to admit when she needs help… Not afraid, even, to admit that she’s vulnerable, alone, that she’s not entirely happy to be without a partner. At the same time, she isn’t overly sentimental about it — though nor is she rushing into the bed of every guy who smiles at her. Overall, it’s a good balance, to my mind. 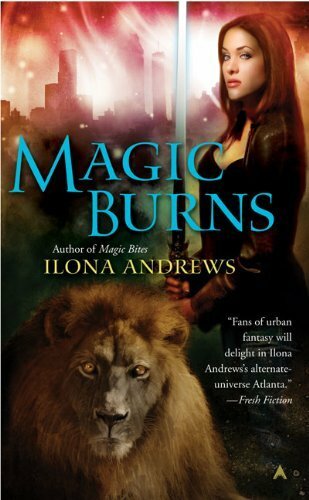 There’s also interesting world building — the circumstances of the magic waves in Atlanta, the history behind Kate that we don’t really get to know yet, the words of power, the different groups of supernaturals… And it’s pretty well paced: there were a couple of points where it seemed to stick a bit, but I pretty much read it in one go. I keep coming to this expecting total bubblegum, but I come away happier than I expected because they dodge so many of my pet peeves and annoyances. I’m really enjoying them, is all I can say! They’re not high literature, but I think they’re fun. and download the free Curran POV shorts. These were originally published on the blog and add to the series as a whole.